The Indian River Inlet Bridge (officially the Charles W. Cullen Bridge) at night. 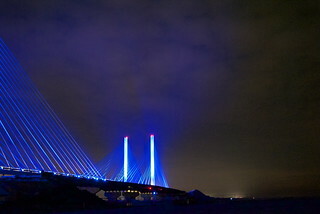 The bridge is lighted in buff blue, one of the state colors. This bridge lighted in buff blue and the Roth C&D Bridge in northern Delaware is lighted with gold lights, the state's other color.